This Gourmet Gift Tower opens up to reveal a collection of 6 gift boxes. 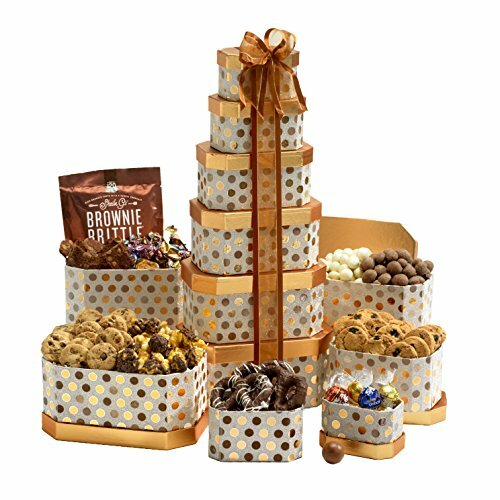 Gift tower includes salted caramel pretzels, assorted fruit flashers, chocolate chip cappuccino cookies, crème brulee trail mix, gourmet popcorn, peanut crunch, blueberry Greek yogurt cookies and soft milk toffees, almond roca buttercrunch! Tasteful Reusable Packaging - Six Gift Boxes are beautifully balanced in use of stackable shapes and clean, attractive designs. Exquisitely crafted to be the perfect gift basket for every occasion and every taste. Perfect as an anniversary basket for couples, a congratulations gift basket, college care package, or a corporate gift basket. Ideal and unique gift as a housewarming gift basket or for a retirement gift. This tower of treats can be adapted to nearly every need: birthday gifts, kosher shiva gifts, get well soon gifts, and more! Gift Box Set Dimensions - 8 in. x 5 in. x 18 in (total stacked height) This gift set is an attractive addition to any occasion and can stand on its own without taking the spotlight from the recipient's special day. If you have any questions about this product by Broadway Basketeers, contact us by completing and submitting the form below. If you are looking for a specif part number, please include it with your message.